Pumpkin Salsa is one of those items that’s so specialized it’s challenging to come up with new things to make with it. It goes with pork, though, and since I’m turning some smoked pulled swine into taquitos, making this as a fall holiday appetizer (or even a main dish) was an easy leap for my lazy self. And, as it turned out, an enjoyable one. Combine the pulled pork, cheddar cheese, softened cream cheese, and salsa in a bowl. Spoon 2 tablespoons of that mixture on the half the tortilla closest to you, then roll tightly starting with that side. Do that over and over until you've filled the desired amount of taquitos. 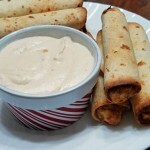 Place the taquitos on a cookie sheet, brush the tops of them with vegetable oil, and bake for 15-18 minutes. During the last five minutes of cooking, melt the butter in a medium saucepan over medium heat. Stir in the cornstarch thoroughly, then stir in the sour cream. When the mixture becomes hot and bubbly, mix in the cheese and salsa. Continue stirring until the cheese has melted and the mixture begins to thicken. Serve it hot.